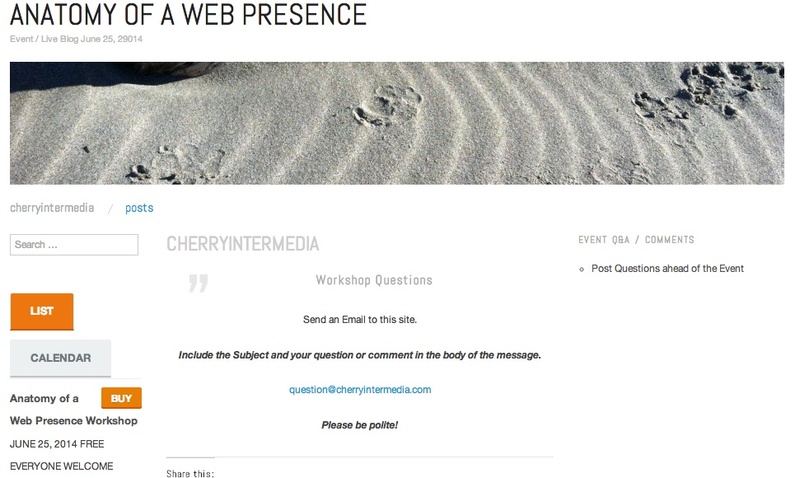 http://Cherryintermedia.com (our live blogging site) is now operating ahead of the Anatomy of a Web Presence Workshop — the site is open and ready to receive advance questions by email. If you’re unable to attend, you can follow the proceedings online at the site during the event. As we go, we’ll post photos, perhaps short videos, new questions and answer them – 2-4PM Wednesday June 25th. CherryIntermedia.com is an InterWestIT live-blogging web property. Search Engine discovery is discouraged, viewers arrive by invitation.The discussion will continue through August. Event posts will be archived and removed after 8/1/2014. Thank you for enjoying it with us. You’re welcome to share the Event Blog with others who may be interested. Discretion appreciated. This event and associated website, the subject matter to be discussed — all revolve around what can be accomplished with free (or very inexpensive) tools online. Posted in Events, WebPresence.Tagged Anatomy, AoWP, Email, Questions.